At a time when hard work isn’t paying off for too many Americans, apprenticeship partnerships are the kinds of innovative programs we need to show students all the available career options, and help put them on a path toward good-paying jobs. Apprenticeships allow workers to get real world experience, figure out where their talents lie, and take advantage of opportunities in manufacturing and the trades. That’s why I introduced bipartisan legislation to make it easier for unions, businesses, and education organizations to start more of these programs around the country, and get more resources to the existing programs that we know are successful. My bill, the Apprenticeship Hubs Across America Act, would create new Apprenticeship Hubs, that will work with employers to develop apprenticeship programs, promote apprenticeships to young people, and provide guidance and mentorship to apprentices during their programs. It would also create a national network of these hubs through the Department of Labor, to share ideas and best-practices, and provide resources to the most successful programs. Many employers lack familiarity with the process of setting up and managing registered apprenticeship programs. My bill would help fix that by providing grants to workforce intermediaries, that will become will become Apprenticeship Hubs. It would also create a national network of these hubs through the Department of Labor, to share ideas and best-practices, and provide resources to the most successful programs. Right now, too many students don’t realize that apprenticeships can be a way to get their foot in the door, and train for good jobs where they can build careers – particularly if they have a union card. According to the Department of Labor (DOL), the average wage for a capable worker who completes an apprenticeship is $50,000 a year, and apprentices who complete their program earn approximately $300,000 more over the course of their career than non-apprenticeship workers. Apprenticeship hubs will make it easier for high schoolers to take the next step toward securing a good-paying, skilled job, playing an important role in building and maintaining our economy and our middle class. 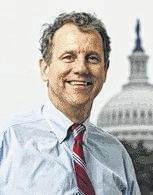 Sherrod Brown is a Democratic U.S. Senator representing Ohio.